A highly successful practicing attorney for more than 31 years, Joe Grove has been able to use his broad and diverse experience-base to the advantage of his clients. Over the years, he has been recognized and honored by both clients and the legal community, and acknowledged as one of the top two “Best Domestic Law Attorneys” in the “Best and Worst” edition of Richmond Magazine in 2007. Known in legal circles as “the bulldog”, Mr. Grove has a win record envied by his peers. Mr. Grove, who prefers to be known as “Joe,’ attributes much of his success to both his life experiences and his education. Growing up in Washington, DC as one of the youngest in a family of ten children, Joe quickly learned that achieving a goal involved working hard, using his intellect and never giving up. This winning attitude is what has helped Joe as he moved from his meager beginnings to his current level of success. Working full-time to support his family while he attended both college and law school, though it was a significant struggle, Joe never lost sight of his dream of becoming an attorney. On a professional level, Joe had the opportunity to put his winning attitude to the test early in his legal career when he single-handedly took on the state of Virginia. 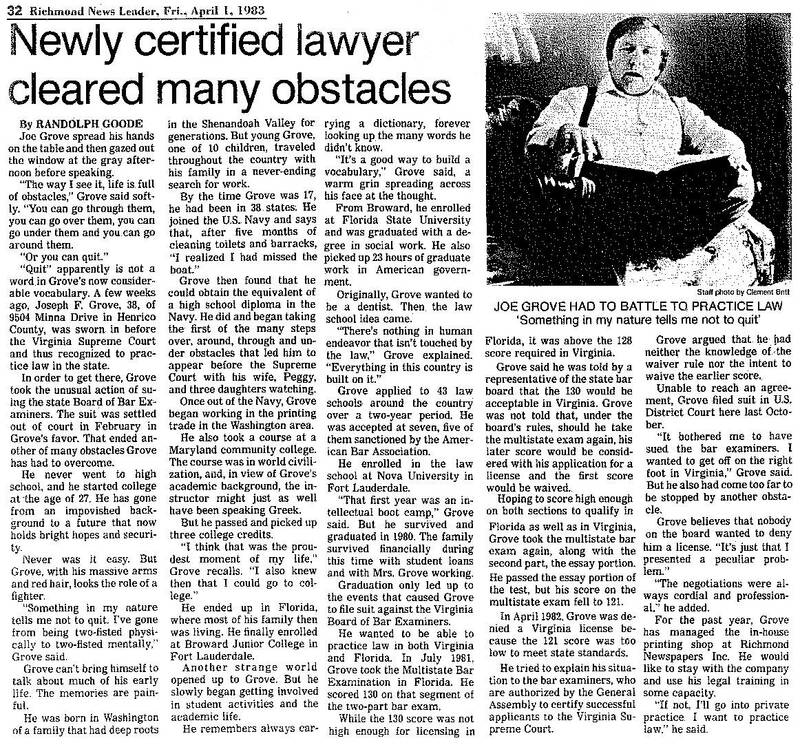 In his first case out of law school, Joe proved his legal prowess when he represented himself in a legal battle with the Virginia Bar Examiners. Although repeatedly told that it was a case that could not be won, Joe persevered. He won. What followed has been an impressive success record. On both a personal and professional level, Joe Grove has many things of which to be proud. However, one of the things of which he is most proud is his skill in tenaciously representing his clients to a positive outcome without compromising his personal and professional integrity. Joe is licensed to practice law in both New York and Virginia. 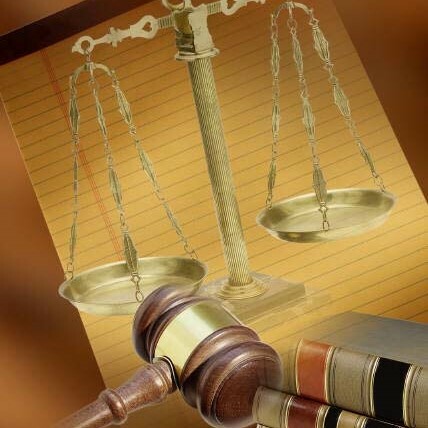 A member of the bars in both states, he is also licensed to practice in all courts in both Virginia and New York. This includes state and federal courts and, most impressively, the U.S. Supreme Court. For the prospective client who is seeking an attorney who wins through hard-work, superior legal instincts and knowledge of the law and who will not give up without a good fight, then Joe Grove is the attorney for you. 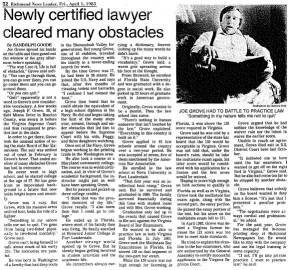 Read about Joe Grove's fight to become a lawyer as chronicled in the April 1, 1983 edition of the Richmond News Leader.